Consider whether you need separate recruiting accounts : for example, if your business is growing and you will be recruiting for several positions, it could be worth setting up a specific channel dedicated to recruitment. On LinkedIn, your company page also features a jobs tab where potential recruits can click directly through to vacancies. If you don’t already have a LinkedIn company page, it would be advisable to set one up to showcase your business and advertise your positions. Set budget aside if advertising : recruiting via LinkedIn can be one of the most effective ways to reach the right people but will require some ad spend to target the right demographics. However, it costs nothing to post on your company pages or across your Facebook and Twitter accounts and you can still find the right candidates with a bit of posting and sharing. Choose the right platforms : there is no point posting across every social media platform if your audience is very specific. Match the demographic of your audience with the platform to form your social recruitment strategy. Here’s a handy guide to social media audience demographics from Spredfest. The key is to focus your efforts on the main social channels (which should include Linkedin, Facebook and any niche social media) and then sparingly update your other social media accounts (e.g. Instagram, Twitter, Pinterest and Snapchat). Make sure your channels are up to scratch: make sure your branding and messaging is consistent across all. If you’re advertising to potential candidates on your channels, then they are going to click onto your profile and you need to make the best impression. Make sure your profiles have banner and profile images, clear company descriptions and up to date information. Check out our guide to improving your LinkedIn profile. Make use of hashtags: on Twitter, Facebook and Instagram you can use hashtags to find the right people – for example, a part-time job could make use of the existing hashtag #Flexiblework or you can include the geographical location to narrow your audience down, for example, #Surrey or #Guildford. LinkedIn has also started rolling out the use of hashtags in posts, so it’s worth trialling them here on personal or company page posts. LinkedIn will suggest some for you, depending on your content, but you can also enter your own. Sharing is caring : the organic reach of most social posts relies heavily on shares to generate more impressions. The more people who share your posts, the more people will see it. It’s essential therefore that your staff all like and share posts to give it maximum potential. Ask your existing staff to like and share your job vacancies – they are the biggest advocates of your company and they can potentially reach a specific target audience of people with similar backgrounds, experience and skills. Be pro-active: you don’t always have to wait for the candidates to come to you, on platforms like LinkedIn you can search using relevant job descriptions to find suitable profiles. If you find some outstanding candidates why not drop them a speculative email? Keeping an eye on the competition is also worthwhile to ensure your employer brand can compete with other businesses in the industry. Monitor your competitors’ channels and ensure that your adverts are as good, if not better. Create graphics to accompany your posts: to catch the eye of potential recruits your post needs to be engaging and must have an image with it. There are numerous free stock imagery sites you can use to find images such as Pexels, Pixabay or Unsplash. Or you can create your own graphic using free tools like Canva. Link the job post to your website: always link back to your website so candidates can find out more about the role, and your company. Does your website deliver on the promises in your job advert? Is the brand, messaging etc consistent? Is your landing page (e.g. your careers page) appealing to the job seeker? Interact and engage: many people post on social media and hope for the best. The key to success on social media is to interact and engage. 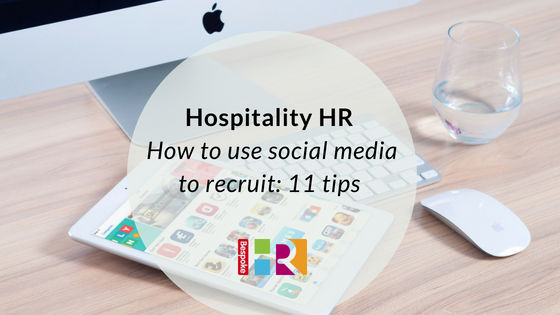 If you can find relevant groups on Facebook or LinkedIn these can be fantastic for sharing recruitment posts. For example, there are geographic groups on Facebook dedicated to jobs, and on LinkedIn you will find niche groups (for example, those specifically for event professionals or those in HR). On Twitter, you can join Twitter Chats which focus on specific topics and take place at a set time each week. Here’s a list of UK Twitter chats from Tillison Consulting. Many people spend a lot of time on social media so updating and refreshing your ads regularly is essential. Change the graphics or images or edit the text every few weeks so that your ads don’t become stale. Get your employees involved. Post employee videos on your website or perhaps on YouTube and have potential candidates understand what a normal day in the office is like. Why not ask a few employees to document their day and upload it to the company’s YouTube channel as a series? We can help with recruitment, for advice or guidance give us a call for a free 15-minute confidential chat.